Pregnancy increases the risk of venous thromboembolism (VTE) 4- to 5-fold over that in the nonpregnant state. [1, 2] The two manifestations of VTE are deep venous thrombosis (DVT) and pulmonary embolus (PE). Although most reports suggest that VTE can occur at any trimester in pregnancy, studies suggest that VTE is more common during the first half of pregnancy (see the image below). Sequelae of DVT and PE include complications such as pulmonary hypertension, post-thrombotic syndrome, and venous insufficiency. 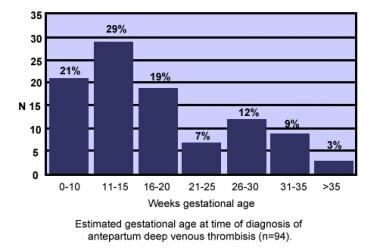 Estimated gestational age at time of diagnosis of antepartum deep venous thrombosis (n=94). The signs and symptoms of VTE are nonspecific and common in pregnancy. Diagnosis of VTE by physical examination is frequently inaccurate, even though one study found that 80% of pregnant women with DVT experience pain and swelling of the lower extremity. D-dimer testing is often used in the diagnosis of DVT in nonpregnant patients due to its high negative predictive value. Pregnancy decreases the specificity of d-dimer testing, however d-dimer retains good negative predictive value in the setting of suspected DVT. Limited data suggests that D-dimer may have lower sensitivity in the setting of suspected PE. Imaging for DVT and/or PE is the best means of screening and evaluation for these conditions. The current initial test of choice in the evaluation of VTE is compression ultrasonography (CUS) of the lower extremity veins. Heparin (unfractionated and low molecular weight) is the preferred drug for managing VTE in pregnancy. In pregnancy, deep venous thrombosis (DVT) is much more likely to occur in the left leg compared with the right leg. One study examined 60 cases of DVT in pregnancy: 58 occurred in the left leg, 2 were bilateral, and none occurred in the right leg. 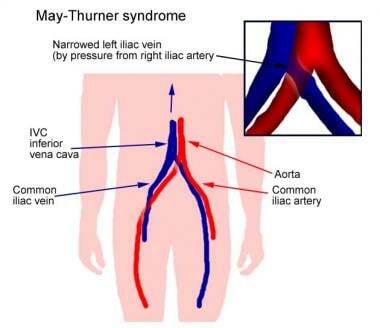 The predilection for left lower extremity DVT is postulated to be the consequence of May-Thurner syndrome, in which the left iliac vein is compressed by the right iliac artery (see the image below). Another special consideration relevant to accurate diagnosis in pregnancy is that 12% of DVTs in pregnancy are in pelvic veins, whereas only 1% of DVTs in the general population are in pelvic veins. This predilection for pelvic site DVTs in pregnancy warrants special consideration when Doppler ultrasound studies of the lower extremities do not demonstrate noncompressible regions of lower extremity veins, yet suspicion for VTE is high or Doppler flow analysis of venous flow is abnormal. Pregnancy is a state characterized by Virchow’s triad (1: hypercoagulability, 2: venous stasis and turbulence, 3: endothelial injury and dysfunction). Pregnancy is a state of hypercoagulability due to alterations of coagulation proteins. Factors I, II, VII, VIII, IX, and X increase in pregnancy. 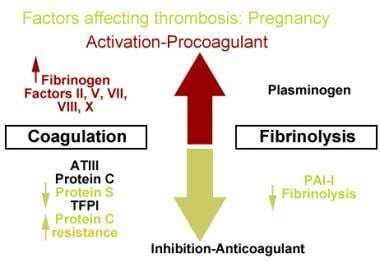 Pregnancy increases resistance to the anti-thrombotic factors such as protein C and protein S.  Thrombophilias can exacerbate these changes in coagulation proteins, further increasing the patient’s risk for VTE (see the image below). Venous stasis also increases as dilation of lower extremity veins occurs followed by venous compression by the gravid uterus and enlarging iliac arteries. Situations of decreased mobility (eg, surgery, cesarean delivery, bed rest, prolonged travel or air travel) may exacerbate these factors. Endothelial injury may transpire at time of delivery. These factors work together to increase risk of VTE in the pregnant and postpartum patient. According to the United Kingdom Centre for Maternal and Child Inquiries 8th Report on Confidential Inquiries into Maternal Deaths in the UK, VTE was the leading cause of direct maternal death in the UK for all but the final of the two year eras reported from 1985 to 2008, more common than death from sepsis, preeclampsia, amniotic fluid embolism, or hemorrhage. Interestingly, the statistically significant decrease in maternal death due to VTE in 2006-2008 era was noted after the first publication of the Royal College of Obstetricians and Gynecologist Green Top Guideline “Thromboprophylaxis during Pregnancy, Labour and after Vaginal Delivery” in 2004. Pomp ER, Lenselink AM, Rosendaal FR, Doggen CJ. Pregnancy, the postpartum period and prothrombotic defects: risk of venous thrombosis in the MEGA study. J Thromb Haemost. 2008 Apr. 6(4):632-7. [Medline]. Polak JF, Wilkinson DL. Ultrasonographic diagnosis of symptomatic deep venous thrombosis in pregnancy. Am J Obstet Gynecol. 1991 Sep. 165(3):625-9. [Medline]. Pabinger I, Grafenhofer H, Kyrle PA, et al. Temporary increase in the risk for recurrence during pregnancy in women with a history of venous thromboembolism. Blood. 2002 Aug 1. 100(3):1060-2. [Medline]. Macklon NS, Greer IA, Bowman AW. An ultrasound study of gestational and postural changes in the deep venous system of the leg in pregnancy. Br J Obstet Gynaecol. 1997 Feb. 104(2):191-7. [Medline]. American College of Obstetricians and Gynecologists Practice Bulletin No 123: Thromboembolism in pregnancy. Sep 2011. Nijkeuter M, Ginsberg JS, Huisman MV. Diagnosis of deep vein thrombosis and pulmonary embolism in pregnancy: a systematic review. J Thromb Haemost. 2006 Mar. 4(3):496-500. [Medline]. Spritzer CE, Norconk JJ Jr, Sostman HD, Coleman RE. Detection of deep venous thrombosis by magnetic resonance imaging. Chest. 1993 Jul. 104(1):54-60. [Medline]. Perrier A, Roy PM, Sanchez O, Le Gal G, Meyer G, Gourdier AL. Multidetector-row computed tomography in suspected pulmonary embolism. N Engl J Med. 2005 Apr 28. 352(17):1760-8. [Medline]. Leung, et al. American Thoracic Society: PE in Pregnancy. Gherman RB, Goodwin TM, Leung B, Byrne JD, Hethumumi R, Montoro M. Incidence, clinical characteristics, and timing of objectively diagnosed venous thromboembolism during pregnancy. Obstet Gynecol. 1999 Nov. 94(5 Pt 1):730-4. [Medline]. O'Connor DJ, Scher LA, Gargiulo NJ 3rd, Jang J, Suggs WD, Lipsitz EC. Incidence and characteristics of venous thromboembolic disease during pregnancy and the postnatal period: a contemporary series. Ann Vasc Surg. 2011 Jan. 25(1):9-14. [Medline]. Ray JG, Chan WS. Deep vein thrombosis during pregnancy and the puerperium: a meta-analysis of the period of risk and the leg of presentation. Obstet Gynecol Surv. 1999 Apr. 54(4):265-71. [Medline]. Jacobsen AF, Skjeldestad FE, Sandset PM. Incidence and risk patterns of venous thromboembolism in pregnancy and puerperium--a register-based case-control study. Am J Obstet Gynecol. 2008 Feb. 198(2):233.e1-7. [Medline]. Treffers PE, Huidekoper BL, Weenink GH, Kloosterman GJ. Epidemiological observations of thrombo-embolic disease during pregnancy and in the puerperium, in 56,022 women. Int J Gynaecol Obstet. 1983 Aug. 21(4):327-31. [Medline]. Ginsberg JS, Brill-Edwards P, Burrows RF, et al. Venous thrombosis during pregnancy: leg and trimester of presentation. Thromb Haemost. 1992 May 4. 67(5):519-20. [Medline]. Bremme KA. Haemostatic changes in pregnancy. Best Pract Res Clin Haematol. 2003 Jun. 16(2):153-68. [Medline]. Marik PE, Plante LA. Venous thromboembolic disease and pregnancy. N Engl J Med. 2008 Nov 6. 359(19):2025-33. [Medline]. Kahn SR, Kearon C, Julian JA, Mackinnon B, Kovacs MJ, Wells P. Predictors of the post-thrombotic syndrome during long-term treatment of proximal deep vein thrombosis. J Thromb Haemost. 2005 Apr. 3(4):718-23. [Medline]. Chang J, Elam-Evans LD, Berg CJ, et al. Pregnancy-related mortality surveillance--United States, 1991--1999. MMWR Surveill Summ. 2003 Feb 21. 52(2):1-8. [Medline]. Pregnancy Mortality Surveillance System. Centers for Disease Control and Prevention. Available at http://www.cdc.gov/reproductivehealth/maternalinfanthealth/pmss.html. January 21, 2016; Accessed: April 14, 2016. Centre for Maternal and Child Enquiries (CMACE). Saving Mothers’ Lives: Reviewing maternal deaths to make motherhood safer: 2006-2008. The Eighth Report on Confidential Enquiries into Maternal Deaths in the United Kingdom. BJOG. March 2011. 118(Suppl. 1):1-203. Andersen BS, Steffensen FH, Sorensen HT, Nielsen GL, Olsen J. The cumulative incidence of venous thromboembolism during pregnancy and puerperium--an 11 year Danish population-based study of 63,300 pregnancies. Acta Obstet Gynecol Scand. 1998 Feb. 77(2):170-3. [Medline]. Lindqvist P, Dahlbäck B, Marsál K. Thrombotic risk during pregnancy: a population study. Obstet Gynecol. 1999 Oct. 94(4):595-9. [Medline]. Simpson EL, Lawrenson RA, Nightingale AL, Farmer RD. Venous thromboembolism in pregnancy and the puerperium: incidence and additional risk factors from a London perinatal database. BJOG. 2001 Jan. 108(1):56-60. [Medline]. James AH, Jamison MG, Brancazio LR, Myers ER. Venous thromboembolism during pregnancy and the postpartum period: incidence, risk factors, and mortality. Am J Obstet Gynecol. 2006 May. 194(5):1311-5. [Medline]. James AH, Tapson VF, Goldhaber SZ. Thrombosis during pregnancy and the postpartum period. Am J Obstet Gynecol. 2005 Jul. 193(1):216-9. [Medline]. Weinberger SE, Weiss ST, Cohen WR, Weiss JW, Johnson TS. Pregnancy and the lung. Am Rev Respir Dis. 1980 Mar. 121(3):559-81. [Medline]. Chan WS, Lee A, Spencer FA, Crowther M, Rodger M, Ramsay T. Predicting deep venous thrombosis in pregnancy: out in "LEFt" field?. Ann Intern Med. 2009 Jul 21. 151(2):85-92. [Medline]. James AH. Venous thromboembolism in pregnancy. Arterioscler Thromb Vasc Biol. 2009 Mar. 29(3):326-31. [Medline]. Bates SM, Greer IA, Pabinger I, Sofaer S, Hirsh J. Venous thromboembolism, thrombophilia, antithrombotic therapy, and pregnancy: American College of Chest Physicians Evidence-Based Clinical Practice Guidelines (8th Edition). Chest. 2008 Jun. 133(6 Suppl):844S-886S. [Medline]. Danilenko-Dixon DR, Heit JA, Silverstein MD, Yawn BP, Petterson TM, Lohse CM. Risk factors for deep vein thrombosis and pulmonary embolism during pregnancy or post partum: a population-based, case-control study. Am J Obstet Gynecol. 2001 Jan. 184(2):104-10. [Medline]. Larsen TB, Sorensen HT, Gislum M, Johnsen SP. Maternal smoking, obesity, and risk of venous thromboembolism during pregnancy and the puerperium: a population-based nested case-control study. Thromb Res. 2007. 120(4):505-9. [Medline]. Knight M,. Antenatal pulmonary embolism: risk factors, management and outcomes. BJOG. 2008 Mar. 115(4):453-61. [Medline]. Morse M. Establishing a normal range for D-dimer levels through pregnancy to aid in the diagnosis of pulmonary embolism and deep vein thrombosis. J Thromb Haemost. 2004 Jul. 2 (7):1202-4. [Medline]. Kovac M, Mikovic Z, Rakicevic L, Srzentic S, Mandic V, Djordjevic V, et al. The use of D-dimer with new cutoff can be useful in diagnosis of venous thromboembolism in pregnancy. Eur J Obstet Gynecol Reprod Biol. 2010 Jan. 148 (1):27-30. [Medline]. Chan WS, Chunilal S, Lee A, Crowther M, Rodger M, Ginsberg JS. A red blood cell agglutination D-dimer test to exclude deep venous thrombosis in pregnancy. Ann Intern Med. 2007 Aug 7. 147(3):165-70. [Medline]. Chan WS, Lee A, Spencer FA, Chunilal S, Crowther M, Wu W, et al. D-dimer testing in pregnant patients: towards determining the next 'level' in the diagnosis of deep vein thrombosis. J Thromb Haemost. 2010 May. 8 (5):1004-11. [Medline]. Wells PS, Anderson DR, Rogers M, et al. Evaluation of d-dimer in the diagnosis of suspected deep venous thromboembolism. N Engl J Med. 2003. 349:1227-1235. Damodaram M, Kaladindi M, Luckit J, Yoong W. D-dimers as a screening test for venous thromboembolism in pregnancy: is it of any use?. J Obstet Gynaecol. 2009 Feb. 29 (2):101-3. [Medline]. Powrie RO, Larson L, Rosene-Montella K, Abarca M, Barbour L, Trujillo N. Alveolar-arterial oxygen gradient in acute pulmonary embolism in pregnancy. Am J Obstet Gynecol. 1998 Feb. 178(2):394-6. [Medline]. Ridge CA, McDermott S, Freyne BJ, Brennan DJ, Collins CD, Skehan SJ. Pulmonary embolism in pregnancy: comparison of pulmonary CT angiography and lung scintigraphy. AJR Am J Roentgenol. 2009 Nov. 193(5):1223-7. [Medline]. Cahill AG, Stout MJ, Macones GA, Bhalla S. Diagnosing pulmonary embolism in pregnancy using computed-tomographic angiography or ventilation-perfusion. Obstet Gynecol. 2009. 193:114-124. Gomes MP, Deitcher SR. Risk of venous thromboembolic disease associated with hormonal contraceptives and hormone replacement therapy: a clinical review. Arch Intern Med. 2004 Oct 11. 164(18):1965-76. [Medline]. American College of Obstetricians and Gynecologists Practice Bulletin No 73: Use of hormonal contraception in women with coexisting medical conditions. Obstet Gynecol. 2006. 107:1453-72. American College of Obstetricians and Gynecologists Practice Bulletin No 124: Inherited thrombophilias in pregnancy. Obstet Gynecol. 2011.
van Dongen CJ, van den Belt AG, Prins MH, Lensing AW. Fixed dose subcutaneous low molecular weight heparins versus adjusted dose unfractionated heparin for venous thromboembolism. Cochrane Database Syst Rev. 2004. (4):CD001100. [Medline]. Guidelines on diagnosis and management of acute pulmonary embolism. Task Force on Pulmonary Embolism, European Society of Cardiology. Eur Heart J. 2000 Aug. 21(16):1301-36. [Medline]. Casele HL, Laifer SA, Woelkers DA, Venkataramanan R. Changes in the pharmacokinetics of the low-molecular-weight heparin enoxaparin sodium during pregnancy. Am J Obstet Gynecol. 1999 Nov. 181(5 Pt 1):1113-7. [Medline]. Ginsberg JS, Hirsh J. Anticoagulants during pregnancy. Annu Rev Med. 1989. 40:79-86. [Medline]. Barbour LA, Oja JL, Schultz LK. A prospective trial that demonstrates that dalteparin requirements increase in pregnancy to maintain therapeutic levels of anticoagulation. Am J Obstet Gynecol. 2004 Sep. 191 (3):1024-9. [Medline]. Schaefer C, Hannemann D, Meister R, Eléfant E, Paulus W, Vial T. Vitamin K antagonists and pregnancy outcome. A multi-centre prospective study. Thromb Haemost. 2006 Jun. 95(6):949-57. [Medline]. Schulman S, Beyth RJ, et al. Hemorrhagic complications and thrombolytic treatment: American College of Chest Physicians Evidence Based Clinical Practice Guidelines. Chest. 8th Ed. 2008. 133: 257S-298S. Warkentin TE, Greinacher A, Koster A, Lincoff AM. Treatment and prevention of heparin induced thrombocytopenia: American College of Chest Physicians Evidence Based Clinical Practice Guidelines (8th Ed). Chest. 2008. 133:340S-80S. Dulitzki M, Pauzner R, Langevitz P, et al. Low molecular weight heparin during pregnancy and delivery: a preliminary experience with 41 pregnancies. Obstet Gynecol. 1996. 87:830. Horlocker TT, Wedel DJ, Rowlingson JC, Enneking FK,. Executive summary: regional anesthesia in the patient receiving antithrombotic or thrombolytic therapy: American Society of Regional Anesthesia and Pain Medicine Evidence-Based Guidelines (Third Edition). Reg Anesth Pain Med. 2010 Jan-Feb. 35(1):102-5. [Medline]. Bates SM, Greer IA, Middeldorp S, Veenstra DL, Prabulos AM, Vandvik PO, et al. VTE, thrombophilia, antithrombotic therapy, and pregnancy: Antithrombotic Therapy and Prevention of Thrombosis, 9th ed: American College of Chest Physicians Evidence-Based Clinical Practice Guidelines. Chest. 2012 Feb. 141 (2 Suppl):e691S-736S. [Medline]. DʼAlton ME, Friedman AM, Smiley RM, Montgomery DM, Paidas MJ, DʼOria R, et al. National Partnership for Maternal Safety: Consensus Bundle on Venous Thromboembolism. Obstet Gynecol. 2016 Oct. 128 (4):688-98. [Medline]. Croles FN, Nasserinejad K, Duvekot JJ, Kruip MJ, Meijer K, Leebeek FW. Pregnancy, thrombophilia, and the risk of a first venous thrombosis: systematic review and bayesian meta-analysis. BMJ. 2017 Oct 26. 359:j4452. [Medline]. Clark SL. Am J Obstet Gynecol. 2008. 52:No SS-2. Chan WS, Spencer FA, Lee AY, Chunilal S, Douketis JD, Rodger M, et al. Safety of withholding anticoagulation in pregnant women with suspected deep vein thrombosis following negative serial compression ultrasound and iliac vein imaging. CMAJ. 2013 Mar 5. 185(4):E194-200. [Medline]. Henderson D. DVT in Pregnancy Ruled Out by Serial Doppler Ultrasound. Medscape Medical News. Available at http://www.medscape.com/viewarticle/777659. Accessed: Mar 5 2013. Bapat P, Kedar R, Lubetsky A, Matlow JN, Aleksa K, Berger H, et al. Transfer of dabigatran and dabigatran etexilate mesylate across the dually perfused human placenta. Obstet Gynecol. 2014 Jun. 123 (6):1256-61. [Medline]. Diagnostic algorithm for suspected Deep-Vein Thrombosis and Pulmonary Embolism during pregnancy. Table 1. Evidence-Based Clinical Practice Guidelines for Venous Thromboembolism, Thrombophilia, Antithrombotic Therapy, and Pregnancy. * If the previous risk factor is pregnancy or estrogen-related or additional risk factors (such as obesity) are present, antenatal anticoagulant prophylaxis is recommended.